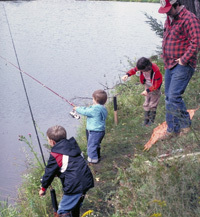 The Healthy Waters Grant Incentive Program provides landowners and community groups with funding and technical assistance for environmental projects on their land. With your help, we can improve water quality and enrich fish and wildlife habitats in the Nottawasaga Valley and Georgian Bay. Only with everyone working together can we restore our rivers, nurture natural habitats, foster fisheries and improve water quality for drinking, swimming and playing. This program is delivered by the NVCA and made possible with the support of our 18 member municipalities, generous program donors and many amazing volunteers.